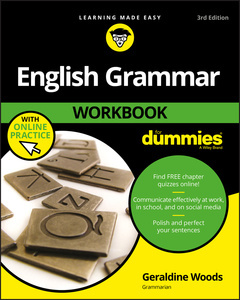 English Grammar Workbook For Dummies is the perfect solution for sharpening the tools in your grammar kit, with lessons and plenty of practice opportunities to help reinforce learning. Whether you need to brush up on the finer points of punctuation, need help making sense of those pesky parts of speech?or anything in between?this approachable guide makes it fast and easy. English Grammar Workbook For Dummies, 3rd Edition with Online Practice is not just for students! While students will find this a valuable resource for preparing for college entrance exams and writing winning admission essays, business professionals, too, will find a perfect resource improving their communication clarity and refining their knowledge of the English language. Geraldine Woods has taught every level of English from 5th grade through AP. Her more than 50 books include English Grammar For Dummies and many children′s books. At www.grammarianinthecity.com, Woods blogs about current language trends and amusing signs she spots around New York City.